I knew I had been off plan for a month but when I looked back I have actually been off Slimming World for over two months! Wow, I really didn't think it was that long. I wrote a post about losing two stone but not losing four dress sizes. Looking back I can see how fed up I was. I was losing weight but not actually seeing a difference, even though photos told a different story. 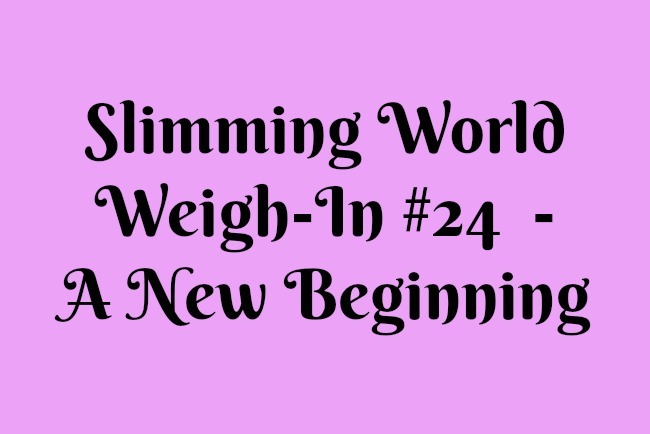 I have still been eating Slimming World friendly meals, well most of the time except for the takeaways, crumpets with butter and so on, and have eaten whatever I fancied in between. Chocolate, biscuits, cakes, lager, red wine....the list goes on. I weighed myself on Monday and had put on four pounds, which doesn't actually seem too bad. My clothes do feel tighter and I really want to reach my goal weight. I still need to lose 32lbs and have a new target date of 24th April if I lose a pound a week. I am hoping that I can lose more than that each week but I have to be realistic knowing that I struggle to lose more. Even on a really good week where I try really hard I only lose two pounds (post menopausal hormones are pants!). I need to remind myself why I want to lose weight. Of course I want to look better but that isn't the most important reason. I want to wear the clothes I already own but are too small and to go into high street stores and buy whatever I like straight off the peg. I also suffer from a bad back (35 years nursing is to blame for that) and a bad knee. Both get worse the more I weigh so with every pound I lose the better they are. I gained my two stone loss badge back in July but now weigh more so that is my first target, to regain that badge. I know if I go off plan (and don't go crazy with food) I will only put on a few pounds which surprisingly gives me an incentive to stick with it. I think it's the knowledge that I have to lose four pounds just to get back to where I was. My target is to lose another stone before Christmas. The countdown begins! 32 pounds, see you next week with an update and a meal plan. Maybe a recipe too. If you'd like some meal ideas visit my instagram feed slimmingworldwithcardigan. From my recent experience, I have learned that losing as well as gaining weight takes alot of patience and hard work. But it all pays off in the end. Losing weight needs so much dedication and patience.I am glad that you have finally taken up a decision to shed some pounds.Looking forward for more updates.